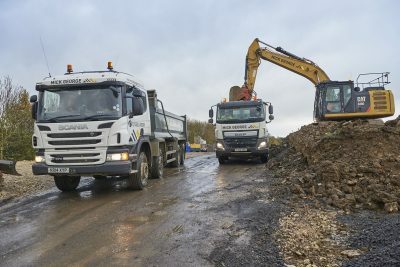 Local construction specialist, Mick George Ltd will imminently begin Earthworks on behalf of Acrabuild (Anglia) UK, on phase one of the Northstowe Education Campus build, located on the former RAF Oakington base to the northwest edge of Cambridge. 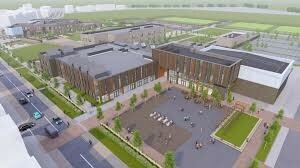 The first phase of the campus, which will cost around £45m, includes a secondary school, a multipurpose school hall / theatre space and drama studios, a sports hall large enough for four tennis courts, a gym, two dance studios, an all-weather floodlit football pitch and a 110-place Special Education Needs (SEN) school. Once complete, also present will be a 400-place sixth form college co-located with the secondary school, a primary school and a nursery, an eight-court indoor sports hall, gymnasium, café, fitness studios and outdoor community sports facilities. The secondary school, planned to open in September 2019, will be run by Cambridge Meridian Academies Trust (CMAT) and will provide places for up to 600 pupils aged 11-16. It will then be extended in two subsequent phases to 1,200 and finally 1,800 pupils. The timing of these phases will be dependent upon the pace of housing development and demand for places from families moving into the catchment area. This sustainable new development will host up to 10,000 new homes and an anticipated population of around 24,400 people. The school will be the seventh secondary school to join CMAT and will work closely with CMAT’s other schools across Cambridgeshire and surrounding areas, including Swavesey Village College, which has been rated ‘Outstanding’ by Ofsted since 2011.